Are you sleeping poorly? Doctors say it's important to look at your lifestyle -- too much caffeine, too little exercise, or too much late-night work or TV. If lifestyle changes aren't enough, medications can help. But supplements may also help provide a peaceful night's sleep. Taken before bed time aids to a restfull nights sleep. Comes in an easy to swallow form of capsule. It is one of the most important nutrients because it is involved in over 300 processes in the body, yet research has shown in the UK that we don’t consume enough of this essential mineral. Today’s food is hugely stripped of magnesium due to the way it is processed which results in many peoples intake falling below the RDA. 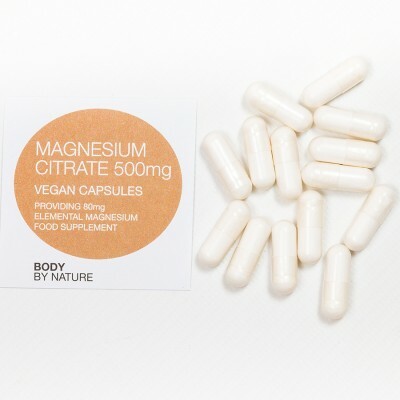 Magnesium activates enzymes necessary for the metabolism of carbohydrates and amino acids. It also helps promote the absorption and metabolism of other minerals and vitamins. Magnesium can be found in foods such as nuts and grains, fish, and meat but if your diet doesn’t contain many of these sources, then this supplement from Body By Nature is essential. Magnesium plays a large part in activating the enzymes necessary for many of the physiological functions, including cardiac function, and the regulation of the acid- alkaline balance in the body. Suitable for anyone and everyone who may need it. Plays a role in maintaining normal bone/teeth Essential for energy production Helps utilise B-complex vitamins, vitamin C, and vitamin E. Beneficial to psychological functions. Muscle function is increased which includes the heart. Contributes to normal cells, nerves and proteins. Wheat; yeast, starch, gluten; soy; lactose; added sugars, colourings, flavourings & preservatives.